Batavia Productions are a brave company. 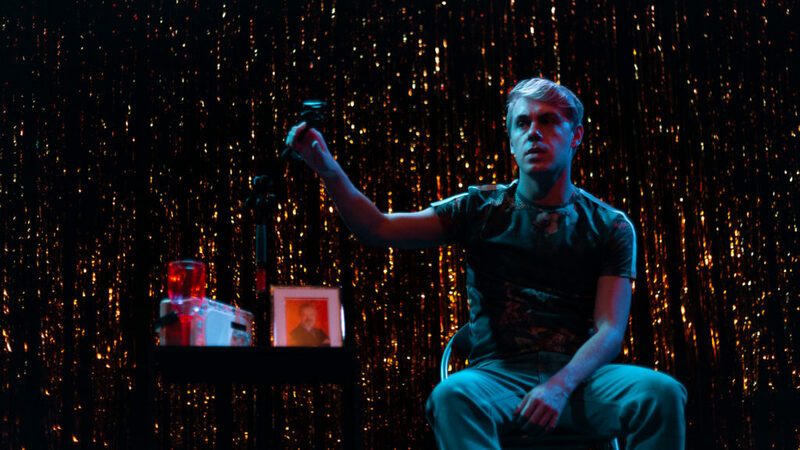 Their work in film and theatre focuses on vital social issues, from sexual harassment to suicide prevention, and this piece, now enjoying an extended run at north London’s Hope Theatre, does not shy away from big issues facing young people. Mark (Jay Parsons) needs someone to talk to, but with being bullied at school, ignored by his family, and isolated by the rest of society, he doesn’t have anywhere to go. Enter Graham Norton. Or, at least, a signed picture of Graham Norton. In lieu of calling into Graham’s radio show, Mark finds peace in his ability to be open with this one photo, revealing the pain he suffers on a daily basis, all leading up to one final, devastating decision. Parsons plays the awkward Mark as compellingly vulnerable and naïve. His confessions do not come easy. As a one-person show, our interest rides mostly on Parsons’ performance which at times seems under energised. A microphone is used to differentiate between characters (dad, school bully, sister) in a way that seems cumbersome and unnecessary. Parsons relies on voice rather than physicality in creating these scenes, and so the characterisations are less precise. Director Joseph Winters could have pushed his actor farther in this regard. Simon Perrott’s script is uncomfortable, shocking and humorous. It is structured well, with a dramatic tension crystallising under the surface throughout the piece. Filled with lucid, fantastical descriptions, the script has elegance but suffers through a lack of engaging stories. The funniest moment involves an unsuspecting cat having a finger shoved up its behind, but even this gets milked just a little too much. Perrott’s insights into a young adult coming to terms with his sexuality certainly ring true however and are a witty reminder how fascinating and scary discovering your sexuality can be. Ultimately though this is a sad tale. Is it a warning of the dangers of online communities? A reminder of how common thoughts of suicide can be for young LGBTQ+ people? We are offered no solutions, just questions. A fairly strong central performance keeps this show going, but if Batavia wants its audience to take action, we need to understand what it is we’re fighting for.